I generally have the feeling that relations between the indigenous people of New Zealand and the various newish arrivals on this bit of geography are not the worst in the world. I realise the standard for worst is pretty low and things are not perfect here either. Still, the only piece of active hostility I knew of recently was the Prime Minister nearly getting nutted on Waitangi Day, and even he seemed to understand that this was part of the role of prime minister. If only our prime ministers would follow his excellent example... Well anyway, that was the only piece of hostility I knew of until this morning, when I was walking down the street in New Plymouth and a lady of Maori origin who was walking in the opposite direction informed me that all white people were bastards and that if she had her way we'd all be on the slab. I was a bit surprised, because I had thought sacrificing people on slabs was a custom of the indigenous people in my part of the world (a very, very, long time ago, obviously), and that her ancestors had stuck to just eating people. Seriously though, I can't quite imagine anyone going through life in New Zealand hurling abuse at every white person they see, so either she was having a very bad day, or she was just being selective - maybe privileging people who are a bit smaller than her, have obnoxiously white hair, or look as though, unlike her, they are having quite a nice day. If she had seemed at all disposed to open conversation on the topic, instead of just hurling vulgar abuse, I could have told her I was leaving the day after tomorrow. It would surely have warmed the cockles of her heart, thought it would have been embarrassing to decide whether it was more diplomatic to appear to share her joy, or look flatteringly downcast at the idea. I am rather downcast at the idea, actually. I've been regarding Auckland with distaste for the last few days, purely because it has an international airport at which I'm expected. It's not as though I want to stay indefinitely, but I keep thinking, oh, maybe another month... New Plymouth is trying to cure me of that. Not only does it contain the one-woman Maori Defense League and a Mount Taranaki firmly hidden under a mass of cloud and rain, but I am staying in a hostel where the staff have been ordered not to issue any heating devices until June. It is coldish and dampish, and I can't even imagine spending May under such conditions. I managed to get an electric blanket from the girl at the desk by looking pitiful. New Plymouth does have its upside. Even though it is quite large, you can walk everywhere I needed to go, because of a careful system of footpaths through parks, fields and cemeteries, and along the seafront. It has a very interesting contemporary art museum with a focus on film, called the Govett-Brewster. I have to say this museum has a lot of the usual display problems films pose for contemporary art museums. They don't seem to have the idea of keeping them in separate soundproof areas. They did provide headsets which were effective for some of the films. Hilariously, the wires on some of the headsets weren't long enough to allow you to wear them and stand inside the circle of screens you were meant to be viewing. I thought we had invented wireless headsets by now? The gallery doesn't give you any way of arranging to see films from the beginning, such as a timer for when they'll restart. Even a restart button might be perfectly reasonable on a day like today, when I was virtually the only person in the place. Some contemporary films can be viewed in a loop, but these ones were all structured from beginning to end and needed to be watched that way. I was very interested in a couple of the films, for a total viewing time of over an hour, so I had to wait around quite a lot, with half an eye on the screen so I didn't miss the restart. I know I spend a lot of time critiquing museum and gallery displays, probably more time than I spend critiquing the contents. I think they have degrees for people like me so maybe I missed my calling in life. The films I watched were Criminal Case 40/61:Reverb by Andrea Geyer about the trial of Eichmann as recorded by Hannah Arendt and Guiding Light by Liam Gillick and Anton Vidokle. Both films were, in their own ways, about the relationship between the individual and the collectivity, which happen to be topics I'm interested in right now. So, I considered the day well spent. One of the tough things about staying in Wellington YHA to catch up with your work and life is parking your car. There's a place about half a mile away on Marine Boulevard, which is free overnight if you choose the right spot, and quite expensive during the day. You have to move your car at 10am away from the free spot to a different paying spot, then move it back again at 4pm. And if you want to load your bags, you have to go get the car, put in in the hostel's driveby and load up. I went to do this at 8.15 am because I was expecting to have coffee in another part of Wellington with a friend at 9.30. It was pouring with rain, windy and generally unpleasant. On my first pass through the area my car should have been in, I noted the presence of police cars then, as I rounded the bend, four officers emerged from a lifeboat, carrying the naked, unconscious or possibly dead body of a man slung between them. I was shocked and disturbed, obviously, but got on with minding my own business and staying out of their way. On my second pass, I noted that they were trying to resuscitate him on the grass. I don't know what's behind this incident, but it's the kind that ordinary citizens don't often get to witness. Given how irritated I currently feel at London's Metropolitan Police concerning their overall attitude and conduct, it's maybe good to have a little reminder of what a cop's day can look like. By my third pass, I would have liked a little chat with a cop myself, to ask them if they were in the habit of towing cars in this neighbourhood, but obviously, it was not a good moment. I was seriously weighing up the possibility though. I have to admit that in reparking my car I had sort of ignored the slightly different regulations for Fridays. I thought I had parked where there weren't any, but I wasn't absolutely sure. Still, this is New Zealand! I couldn't imagine them towing people for a bit of absent-minded parking. They probably just get your cellphone number from someone who know you and offer to deliver your car to your door in exchange for a small fine. There were obviously several possibilities for looking like an idiot here. The one I liked best involved finding that I really had parked my car much further away than I thought, turning up approximately on time for coffee with my printmaking friend, then sharing with her the knowledge that her newfound acquaintance is an airhead. I decided I really had better walk all the way down to the end of the parade, checking every number plate. I spotted a distant car that looked exactly like every other car around here including mine, wishing deeply and sincerely that it would be. Thankfully, it was. It had been such a nice day yesterday, I must have fancied a long walk back. The rest of the morning went according to plan. I had coffee with Ali, then she took me round the local cemetery in the rain. One of the things she told me is that Wellington really is the way we suspected, and the weather tends to be like this. The cemetery is a very large and amazing place, and what really touched me was the way it includes people of many religions. There is a large section for Chinese Christians, a bit interspersed with graves of people with English names, and probably Protestant denominations. Then there is a very large Jewish section. All the servicemen are together, the Greek Orthodox denomination have a whole hill, Catholic nuns and monks are buried in modest rows...unlike one of the prime ministers who offered himself a large canopy arrangement. Ali introduced me to her friend, the one-eyed gravedigger, who keeps her supplied in dog bones... Ok, ok, just kidding! He talks about keeping her supplied in dog bones. He knows everything about everyone who died or is about to die in the immediate future, plus everything about the state of local politics in the cemetery workforce. He let us in to the small chapel, with its very beautiful imported Irish stained glass windows which was really nice of him. I went back later and took some photos of the Jewish cemetery and of the one Indian memorial I could find. I would have liked to do more, but it takes five hours to get to New Plymouth so I have to press on. ... who are from Sheffield and Rotherham in England. 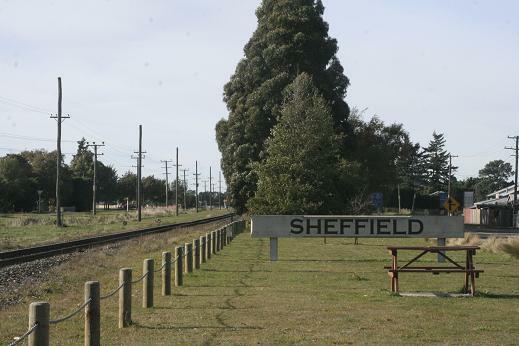 I have driven through Sheffield and Rotherham, NZ, both on South Island, a bit to the west and north-west of Christchurch. I would have taken more photos of both of them, but there is not a lot to see except trees, grass and hills. Actually, Sheffield is a bit bigger than Rotherham as it is in England, and has a pie shop, but somebody had parked a car in front of it, completely obscuring the building. The two villages are much further apart than the the English counterparts, probably 3 or 4 hours drive and actually, I went through Sheffield on Monday, spent a whole day at Hanmer Springs and passed through Rotherham on Wednesday on my way to the ferry. I suppose that both villages may have been founded by people who were from Sheffield and Rotherham, or at least that area, but I didn't find out. The rest of this blog will be updated slowly, so check for posts before and after! In the morning, I went for a quick look at the glacier and another quick look at the forest. It had just rained on the West Coast so the forest was as I like them: all plump lichens and dripping mosses. I really didn't stay long though, because I wanted to get to Wanaka in time to hang out and relax a bit. There is really not much to say about a day at Hanmer Springs - in the way of adventure and excitement that is. Basically, you go there, get a double entry pass, slouch around in warm water, go and swim a few laps, repeat until wrinkled. Then, go to the cafe, order breakfast at about 1pm (I love all day breakfast), do a little writing. Go for a walk in Hanmer Forest then a quick nap. Round about when it gets dark, return to continue slouching in warm water. I could do this every day for months on end, except for one little problem. It seems that after even one day of it, I have to wait another three days for my skin to recover. New Zealand has a way of making things easy. I think it's because there's just the right size population density that people are reasonably cosmopolitan in their outlook but can still manage to go around treating people like people. If you happen to get lost on your way somewhere it's easy to pull over and figure it out without having to think too much about other traffic. The shops tend to have exactly what you need and no more. The art shop in Wellington had exactly what I need for the print making workshop. Accommodation pretty much always comes with a kettle, a toaster, a fridge, a microwave and a full set of plates and cutlery. If you happen to be hapless and indecisive, the kiwis let you get away with it. I supposedly printed out my ferry ticket last night and discovered this morning that it only printed the email header. No worries. I discovered that the coffee machine on the ferry dispensed brown water instead of long blacks. Oh well, that's what it does, but no worries, chuck it out and go and buy a real one downstairs. If this goes on much longer, I am going to really struggle when I get back home. Or, more likely, as soon as I get to Asia. It was raining hard as we croosed the Cook Strait and it was choppy as usual but it isn't likely to affect me. All my family knows this already, but for any other readers who happen here, this is a fun factlet: the ferry that plies the Cook Strait under the name of Kaitaki is really the Pride of Cherbourg and I've been riding it across the channel since I was so high. It's very funny to find a cross-channel ferry down here, not to mention thinking up little stories about its migration to New Zealand. I was supposed to be getting four hours of work done on the ferry crossing, but getting up at 5 am had not helped my concentration and I spent the time watching the large flock of black birds flying ahead of the boat instead. It's a longish drive from Picton to Hanmer Springs and when I got there and checked in to the hostel, my attitude was something like: "Well, this is a lovely place. Goodnight!" It was only sort of goodnight, because the hostel at Hanmer Springs, though lovely, has rooms you can easily lock yourself out of. At which point you have to go and beg a second key from the manager. I begged mine at 10.05 pm, after he'd shut the office door, but before he'd left. He was also OK about my haplessness. It is a funny thing about being on your own. You are under no obligation to agree on plans with other people so you don't even agree with them yourself. Half the time I don't really know what I want to do until I've done it. This morning, I didn't know if I wanted to go up to the start of the Tongariro or to swim in lake Taupo. I also had some writing to finish. I decided to collect everything I could possibly need and just set out and see what happened. At the intersection I drove towards Taupo, and stopped at the best picnic spot along the lake. For some reason this is a spot I always end up in. It was cold even out of the water and I realised I had forgotten my towel, a change of underwear and my hiking boots. I sat in the car with the door open, looking out over the lake and writing. When I finished a big piece of writing I evicted a large bumblebee and several smaller bugs from the car and decided what I really wanted now was poached eggs. For some reason, I'm addicted to poached eggs in New Zealand. I sat in the cafe, tidied up my writing work, and considered the fact that I still didn't know what I wanted to do. I decided that if I drove back to my picnic spot and parked in the sun the car would turn into a green house. I could go swimming in my wetsuit, then warm up in the car even without a towel. Then I could drive to Tongariro, by which time my swimsuit would be dry and I would go for a late afternoon walk along the easy parts. Actually, at one point I tried to convince myself I would be better off returning to the hot springs, and that the cost of entry would make up for the savings in petrol. It was only the thought that this would be boring of me that made me change my mind and follow the plan instead. I stayed in my room all morning, working and drinking cups of coffee. It had suddenly got so quiet I couldn't tear myself away. Eventually, I decided I had better go and do some drawing in the Tongariro forest, so I have something ready for my printmaking workshop in a week. I got there and found that the forest as I had seen it on two other occasions was more special than I realised . Now all the lichens, mosses and ferns are dry and thin. It's a good job I have some photographs. I set about doing some composition drawings anyway. I am starting to worry about whether I will be able to get everything I need for this workshop together in time. I have to buy lino cutting tools - and if you know New Zealand, you will know that you don't just suddenly decide you need something like that and go out and buy it in some random small town. I decided I would have to cruise the art shops of Wellington and if that failed, those of Christchurch. I wondered what would happen if I couldn't get any. Later I wandered off to see another forest the hostel manager had told me about, but I really felt drawn to the lake and mostly hung out there till evening. Even though our hostel is full of people who do proper cooking, I'm not feeling interested at the moment. In New Zealand, there is a brand of ready-made Indian food you buy in pots, which doesn't need refrigerating. To my delight, Turangi's New World had the full range, so I now have enough meals to keep me going for quite a long time. I was so tired in the morning that all I could do was drive into Taupo in the morning to get poached eggs for breakfast and sit there looking spaced out. Everyone was being intensely solicitous of me, today and yesterday, and I couldn't figue out why. I supposed I looked exhausted, but not that bad! Then I realised that Easter is this big family holiday in New Zealand when everyone gets together and here I am on my own. Of course, they don't realise that as far as I'm concerned Easter is something I'm vaguely aware of as a practical issue of what will be open and where the crowds will be. Well, I have eaten my share of hot cross buns, but I am not in the mood for NZ's version of chocolate. Seems like we went straight from mince pies to hot cross buns this year! After 'brunch' I went and dozed by the lake for a while, then checked in at my hostel where I dozed some more. It is probably just as well that I did. Hostels vary in their character from night to night, but what they seem to have in common is small rooms and poor soundproofing. This is the biggest room, I've had so far, though it has other issues, such as the smell. It is in some kind of converted worker's hostel, wildly decorated in an unprofessional but determinedly international style. Which it has earned, as you will see. The real problem is the group of European kids who were staying here when I arrived. When I say 'kids' I mean old enough to travel round the world without adult supervision, but you wish they weren't. They came in at 10.30, started playing Tag in the corridor, ... eventually went to bed, woke up at 6.30, chattering and squealing like a playground. The next night, the kitchen seemed to contain nobody but a couple of Chinese ladies, cooking something very complicated for their quiet, pleasant families and chatting in low voices. The night after that, the kitchen was full of a more sober variety of Europeans and Americans, seasoned travellers chatting and exchanging ideas. In the morning a small group of girls who might have been Malaysian - at any rate, Muslims from this general part of the world were busy preparing enough food to feed about twelve people, which eventually turned out to be the size of their group. The hostel is super cheap, and I can live with it quite happily, as long as I don't have to listen to anyone else complaining about it. I might want to wash everything I own after I leave, though. I had this vague plan in the back of my mind to go to Te Urewera. It's a wild and densely forested national park, somewhere in the middle of the north east. It was problematic: the road might be washed out - the national park website is uncertain about this and so are the rumours flying round the hostel. It would take a long time getting there. Suddenly realising yesterday evening that easter weekend was upon me, I thought I had better reserve some places to sleep and arranged a hostel in Napier. If I sacrificed my writing time in the morning and left super-early, I might get to Te Urewera and on to Napier in a day. Assuming getting there was possible at all. All that to see a wood. Eventually, I decided it was a good thing I had not gone, because it rained most of the day in longish, heavy showers. For once, I was glad to be driving an automatic, because my hand was constantly on the wiper lever, trying to adapt. The road did not seem especially interesting, until I came over a pass and looked down on to a wide gorge with the biggest brownest muddiest river I have ever seen flowing through it. Unfortunately, there was not a very good place to take a photo of it. Once I got down to the river level, I pulled into a picnic site under a viaduct and discovered I could not see much from there, except for two dead sheep, with very impressive horns, occupying the middle of the picnic area. I must be a strange kind of person because I was more interested than put off by them. I sat in the car eating my lunch and wondering how two of them managed to die right here on a perfectly flat piece of unflooded grass, far from steep cliff faces. Maybe they had fought each other to exhaustion with those horns of theirs. Other people kept driving in to the picnic stop, noticing the two dead sheep and driving off again. In the end, I found this behaviour disconcerting and drove off myself to find an open cafe and do a couple of hours of work. There are lots of people on the road for Good Friday, and work crews have obviously been hard at work to make those roads passable. I drove along the edge of a lake that was trying to overflow onto the road. At various places, I could see where the road crews had bulldozed their way through mudslides. My goal is not to be around when one happens. I found a flooded picnic area I couldn't get into, but it is perhaps the most photogenic face of the flooding. So when are we going to learn that you can't just deforest, huh? This doesn't look so good either. Actually, the photos in this post are a trail of destruction. I got to Napier where the weather was beautiful. I went for a long walk along the beach watching the high surf crash and throw the driftwood around, then back to my hostel at sunset. So - it is really cool in the hostels 'cause there's all these people to socialise with (err, depending on their social skills). I was down there making my dinner while a group of older people were sitting around eating a homemade apple pie one of them had brought. I didn't think much about it till one of them asked me if I wanted a plateful and handed it to me. Of course, I thought that was nice of her so I said I would eat it for dessert and took it to a table with my main course. No sooner had I started eating but another member of the group walked over to my table and demanded to know what I was doing with the apple pie. So I pointed out the person who offered it to me, then they nearly had a stand up row over whether I could have the pie or not while I protested that it was ok, I didn't have to have the pie! The possessive pie person stormed off with the plate, dumped it out into the pie dish and presumably dumped that out into the bin. Can you imagine?! Well then, I couldn't let the woman who offered me the pie go on apologising all evening, so I tried to change the subject of conversation to her group and their trip. She didn't seem keen to tell me much about that (? ), but she did tell me all about earthquakes, flooding and high seas, so it worked out. Wow, what must it be like to share a room with possesive-pie-person though?! I have to have my own room so I can socialise at my discretion. (Actually, Napier YHA does have impressive architecture and nice rooms as well - 'interesting' co-guests not guaranteed!). It is definitely the end of the tourist season in New Zealand. Yesterday's newspaper had the headline 'Where have all the crowds gone?' I feel a bit like a swallow that's decided it can't be bothered with flying south (or north) for the winter and has decided to stay on. At the moment I'm basking in the peace and quiet and it's every bit as pleasant as it was last week. The rain cleared up to leave patches of pale blue sky, the trees are dripping and a few are showing signs of autumnal colour which is a surprise for New Zealand. The local white backed magpies are out in force. After I finished a few hours of work, I set off to explore the parts of East Cape immediately above Gisborne as far as Anaura Bay. Actually, Anaura Bay was a bit forbidding in its beauty. It contained a few houses and a shut down motor camp covered in signs informing members of the public that Anaura Bay has no public facilities but they will be prosecuted if they use those of the camp. I hardly dared park outside its gate, even though there was nowhere else to park. Fortunately, I didn't have to stay long because the only access to the beach arrived in a small section of sand fenced in by a couple of deepish rivers heading for the ocean. I snapped a few photos and left. Rain in the distance and sun on the surf. I fared rather better at Tolaga Bay. It has a smart car park, public facilities and a team of people planting trees to make it even better next year. I walked out along the 'very long historic (and crumbling) wharf', noting that it would be a bad idea to lean on such parts of the barrier as remained to take photos. I eyed the heavy swells and breakers nervously. They were brownish-yellow with mud and sand and I felt sure that if I ended up in them, I would be abraded to death before I drowned. Wharf, and water you wouldn't want to surf in. Next, I walked up the road to take a look at Cook's Cove walkway. I wasn't at all sure I wanted to climb a muddy hill today, but you know what it's like. Once you start, it's hard to stop. I told myself there might be good views at the top, so up I went and over a stile. A hundred metres further on, I discovered that someone had put a bull in this field. Just the other night, I had a dream in which a bull charged me and I just stood there thinking 'na, he'll swerve at the last minute'. Which of course he didn't. I remembered the dream and felt apprehensive, but true to form, I thought 'na, why would he?' I kept on walking along the edge of the field but the next time I glanced at him, he was pawing the ground and glaring at me in a way that would be familiar to anyone who has much experience with bulls. I decided to let discretion be the better part of valour, hopped over the wire fence and scrambled back along it to the stile. I would just make do with the view from here. I must say that though the countryside here is as beautiful as usual, it has a stripped bare look as though this was not the sort of land that could afford to lose its trees. I expect that may account for the muddiness of the rivers and even the ocean. Wow, that was quite a drive. I started from Ohope, along the coast to Opotiki, then down this infamous Waioeka Gorge that they close at 5.30. I wondered if they do that because of road works or so the kiwis can get some peace. Anyway, it is beautiful and wild, and I had the road pretty much to myself. But every time I caught sight of the river I noticed how brown it was against the green forest. That was strange, as if it had been raining hard and dumped soil into the river. I hadn't noticed any rain the last few days. After a while, it occurred to me that a river gorge couldn't possibly cut through a cape from shore to shore and eventually I would have to climb a pass. No sooner had I thought it than I started going up and small spitlets of water started hitting the windscreen. Further ahead I could see one high hill after another stretching back into mist and dark grey cloud. The other side of the pass was rainier but it wasn't until I reached the flat fields and vineyards around Gisborne that it got torrential. The closer I got to the ocean, the harder it rained, until my wipers couldn't keep up. Around me the fields had turned to rectangular ponds and the ditches were full and spilling out over the road. I wondered how long this had been going on for. Quite a while by the looks of things. I drove through a nearly drowned Gisborne over a fat brown river and reached the YHA. Whatever it may lack in luxury it makes up for in architecture. It is the largest house I have been in for a long time - lego block motels don't count. In the dark and the rain it gave the impression of being a sort of cream coloured Victorian Gothic pile, only made of wood. Outside it smells of wet leaves, which for some reason, makes me think of London. Inside, it is full of people hanging out in the living room, watching television and wondering when it will stop raining (I suppose that should also make me think of London). I have a room of my own which is just as well as I have a backlog of work to do. I am just curling up with my snacks and my computer. I certainly want no part of the rest of Gisborne in this weather. PS: I did eventually go and see Gisborne the next day when it stopped raining and discovered that it is one of NZ's fancier towns. I believe we've been travelling for a year today, so it must be day 366, even though I seem to have lost some days somewhere. If anyone is clever enough to notice it was a leap year, I have also allowed for the day we lost as we crossed the Pacific. Anyway, on to other things. Today was a long day that started at the house we left in Okiato and ended in Rotorua. Over 450 kilometres through sections of New Zealand that have population densities approaching those of Europe, on roads that were meant for low population densities. After I left Mike and Antonia at Auckland airport I did the second half of the journey in a daze. It is always hard to drive with a handheld gps on one's knee to do the navigating. Mine has the creative routing skills of a child and it is always worth second-guessing it, but that is a yet another thing to do, so I didn't. Eventually, Ireached Rotorua. I had forgotten how much the places stinks - of sulphur technically, but it might just as well be rotten eggs. It comes in gusts too, so that you can't even get used to it. By 6pm, it felt like at least 9pm. I had no intention of drinking Rotorua's tap water given the pungency of its air and I was suddenly becoming conscious of the fact that I'd had next to nothing to drink all day. I set off walking to Hell's Pizza which was just round the corner, slowly realised how big the corner was and went back for my car. I sat and waited for my pizza wondering if I would pass out from dehydration. Then I drove to the supermarket, which is about a mile away just across the street and bought a ten litre jerry can of water. I think I was so thirsty that it looked like just enough. Somehow, I hauled the ten litres of water, the pizza and the salad up to my room. I tried to open my jerry can of water, because drinking its contents was my top priority and discovered to my dismay that the cap was designed to be removed by big strong guys who are not dying of thirst. I wondered if I would die before I could get help, then, amazingly enough the cap came off. I decanted a glass of water, and started trying to fit my jerrycan into the fridge. I removed the fridge shelves, but there was still no way! I decided to give up before the bottle split and spilled nearly ten litres of water all over the floor. Two more glasses of water later and it was time to attack the pizza, well, guzzle is maybe more the right word. At some point later on I started to notice that Hell's Pizzas are really pretty good and that I have very good taste in toppings. Immediately after, I realised that if I passed out now, it would be exhaustion rather than thirst or hunger so it was safe to do so. I put Ozzlie, my tasmanian tiger Antonia gave me for my birthday on my pillow and went to bed.